Research paper. A careful morphological study of the Aramaic language as seen in the Targum of Isaiah. 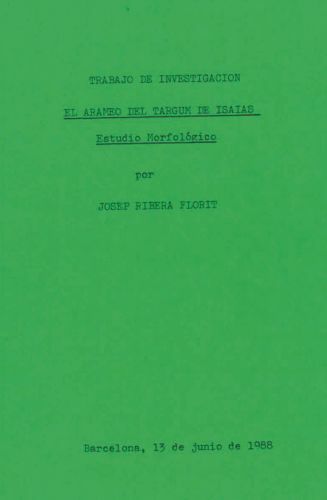 Study serving as a reference for Targum Jonatán de los Profetas Posteriores en tradición babilónica: Isaías (1988), published in Madrid by the Department of Biblical and Ancient Near Eastern Philology of the Institute of Philology at the CSIC (Consejo Superior de Investigaciones Científicas; Spanish National Research Council).